The Sumatran elephant Conservation Response Units (CRU) Teams are composed of captive elephants and their mahouts, government forest rangers, and the local community. 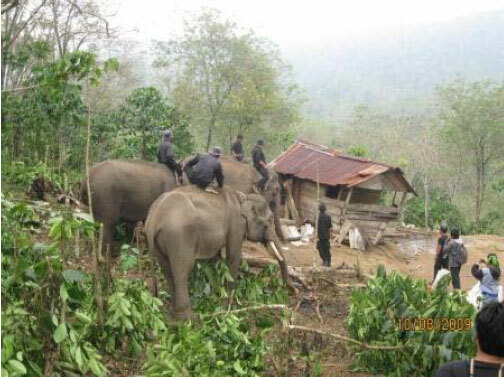 Captive elephants provide transportation during forest monitoring patrol activities, as a tool for gaining local community interest during awareness events, and driving away crop raiding wild elephants should conflict incidents arise. 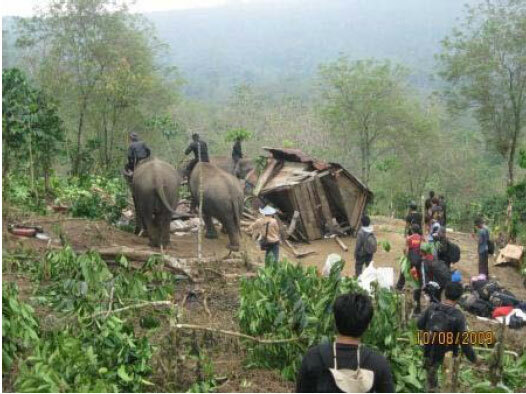 Mahouts, as part of the CRU Team, not only take care of the elephants but are involved in all CRU activities. Each CRU Team conducts patrols for 7-10 consecutive days a month during which CRU Team members record sightings or evidence of illegal activities, human-wildlife conflicts and wildlife presence. The Team carries hand-held GPS units to properly identify sighting locations, and a digital camera for documentation purposes. They also fill out report sheets and a narrative when they return from patrol and this data is provided to the partner Natural Resources Agency of Bengkulu (BKSDA offices. CRU staff plays an important role in educating communities living in proximity to the forest about wildlife conservation and protection. With donor support of multiple aspects of the CRU operation, this program has grown and the management of the captive elephants at the Seblat and the other government ECCs has dramatically improved. Each elephant receives sufficient food and water and regular veterinary care thus protecting and preserving this small population of previously wild elephants. Through the ongoing CRU project and annual Mahout Workshops, the mahouts are taking pride in their work and now understand that taking care of this population of elephants is an important and honorable profession. They also have come to recognize that this is an opportunity to learn technical skills to improve themselves and their standard of living. Most significantly, the mahouts have developed a love and understanding of wild spaces and wildlife, and their role in conserving Sumatra’s forests for generations to come. Currently the CRU Team is helping to manage the existing forest (6865 hectares) assigned to the ECC and the wildlife (elephants, tapirs, tigers, etc) in the forest. The CRU Team monitors forest crime and assists in its prevention by reporting illegal acts and conducting interventions with the perpetrators and the surrounding communities with conservation awareness and education programs and materials. The CRU Team is always available to intercede in conflict situations such as herding problem elephants back into the forests thus protecting villages and food supplies or dealing with the rescue of tigers and other wildlife species. The information generated by CRU patrol data is helping develop a master plan to manage the conservation area, plus develop means for the ECC to become more self-sustaining. Throughout this past year, various activities relating to species and habitat management and protection through the CRU Seblat have occurred. 1) Influence land use planning in the proposal to increase the protection status of the Seblat forest area including the Air Kuro Corridor to Kerinci-Seblat National Park. Since 2005, both administrative and field work has been conducted of the Seblat- TNKS corridor. Various meetings at the regional and national level and many verbal and written correspondences have occurred encouraging the support for the designation of the new conservation area in Seblat. 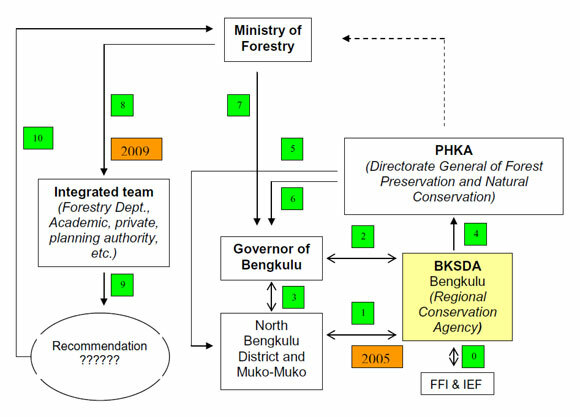 Based on the CRU team reports and data from the field which have shown the necessity of the Air Kuro corridor to wildlife conservation and the increasing problem with illegal land encroachment, BKSDA Bengkulu has started the proposal process of increasing the status of Seblat forest and expanding its size to cover the Air Kuro Corridor, as well as some limited production forests (HPT Lebong Kandis II) that connects Seblat Forest block to the Kerinci Seblat National Park. Scheme 1. FFI-SECP and IEF have been actively involved in the process of supporting BKSDA both at local and national levels for increasing the status of Seblat forest area form 2005-2009. The process is still awaiting a feasibility study’s recommendation. This study is being performed by an integrated team from various stakeholders who will provide their conclusions to the Ministry of Forestry. FFI-SECP coordinator and IEF have been actively involved in the process of supporting BKSDA at both the local and national levels. A meeting was in Bengkulu on the afternoon of March 8 with representatives from BKSDA Bengkulu, IEF, FFI, CSI and DICE-MKMG to discuss the best approach to create awareness in the local Seblat community about the need to preserve this corridor between the Seblat forest and Kerinci Seblat National Park. Currently the CRU staff raise awareness about the need for forest protection via their patrol work, but the message about the importance of conservation areas such as the corridor between the Seblat forest block and the Kerinci Seblat National Park needs support from the local heads of villages in this area. Basic improvements to law enforcement have been achieved through the regular patrolling of priority elephant habitats. Comparing the years of 2006, 2007 and 2008, the number of illegal activities have decreased. After achieving great success in dealing with the illegal logging, illegal hunting and encroachment inside the Seblat elephant forest, the CRU Seblat team is now finding the majority of forest crimes, primarily encroachment, is occurring in the corridor Lebong Kandis II which is actually placed outside the existing Seblat BKSDA managed area. Generally all of these activities have provided a significant amount of security to the area. Figure 1. 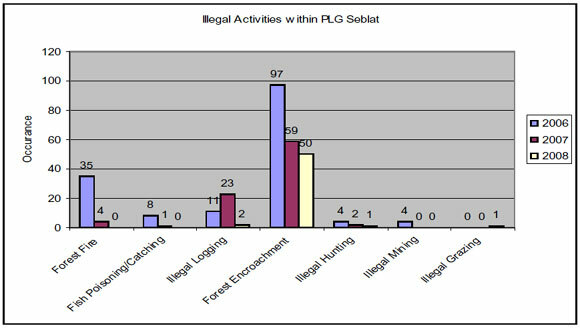 Illegal activity cases within PLG Seblat from 2006 to 2008. 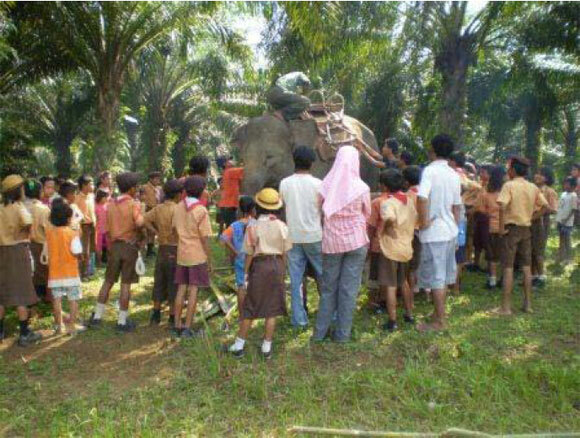 Human elephant conflict (HEC) is a major threat to the Sumatran elephant. HEC results in a lack of local support to conserve this species and its habitat. HEC incidents threaten elephants as it leads to both retribution killing, and to the capture and removal of elephants, which then remain in captivity. Achieving a sustainable reduction in the impact of human-elephant conflict requires a comprehensive and integrated approach. CRU Seblat is monitoring the movement of elephants in the Seblat area and in the production forest outside Seblat. HEC occurs due to the habitat being disturbed by illegal logging, encroachment, and encroaching plantations. The CRU Team records all activities daily and reports the data to the Programme Manager every month. While conducting routine patrols, the team notes their findings of fauna and flora and any illegal activities. Data indicates that the forest around the camp is home for many species of wildlife including; tigers, deer, tapir, hornbill, pheasant, gibbon, bear, etc. Community visits and raising awareness occur on a regular basis as part of the patrol duties. During the past year, the visits were conducted at Merindu, Suka Baru, Suka Maju, and Suka Medan villages and information such as brochures and leaflets were distributed. The team also conducted awareness activities for the land encroachers in HPH Lebong Kandis and Talang Usman. This is an important activity as these communities are made up of individuals who are mostly unaware of the importance of forest protection. School visits have also been conducted on a regular basis by CRU staff. 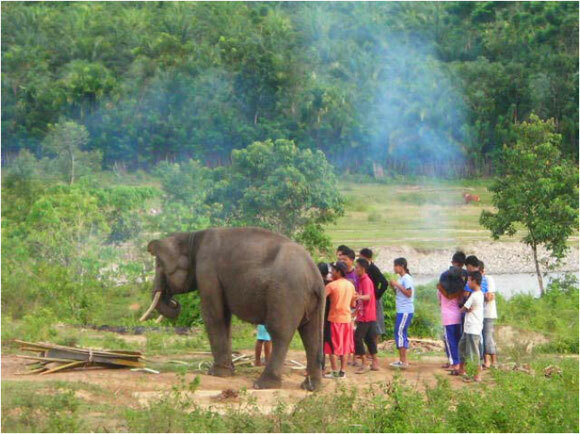 A new community group was developed in some of the villages closest to the camp; the Community Elephant Care is helping the Seblat ECC with various educational issues. They are actively involved by having a member participate in the CRU patrols, and also have representation in the new post that CRU is building in the Seblat forest near a contested area, the Jalan Poros road cut through the forest by surrounding plantations and the site of a successful police operation to stop illegal logging in the summer of 2008. Some of the community group members traveled to Tangkahan in North Sumatra to see how the CRU operates there, and to learn about the potential for helping develop ecotourism in the Seblat area. This new community group is hosting community wide meetings and setting up informational stands about the ECC at various local events. They have been well-received by the local communities. The CRU Seblat has been supporting the implementation of a collaboration between BKSDA and Sapta Buana and Agricinal palm oil companies surrounding the Seblat elephant camp. 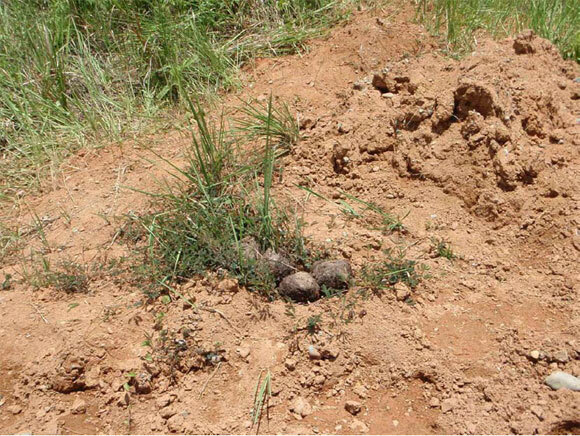 Some limited collaborations have occurred in response to human-elephant conflict mitigation in the Seblat area. Sapta Buana provided the CRU operation with heavy equipment and trucks for some field cases. However the collaborations have been limited since the agreement on providing a road through the Seblat forest to be used as a short cut for the company owned plantations has led to rampant land encroachment. 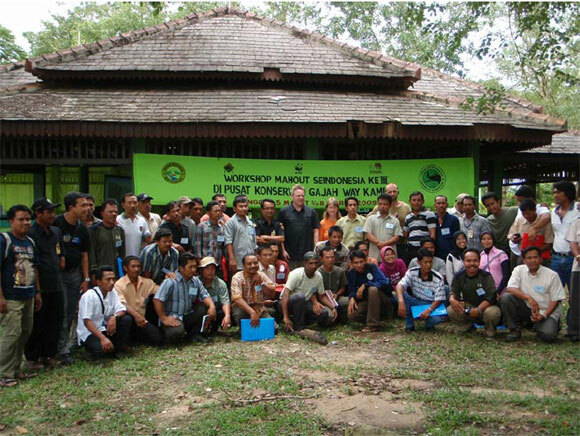 The Mahout Workshop was held in Lampung province at the ECC Way Kambas located in Way Kambas National Park. In attendance to officially open the workshop were Ibu Siti Chadidjah Kaniawati, Head of Sub-Directorate for Species and Genetics, Directorate of Biodiversity Conservation for PHKA; the Director of Way Kambas National Park; Pak Nazaruddin, head of FOKMAS; Dr. Wahyu, Director of VESSWIC, and Heidi Riddle for IEF. The workshop was attended by 55 participants including representation from all of the BKSDA camps in Sumatra, as well as from many facilities (zoos, wildlife parks, etc) all over Indonesia. After the formal opening ceremony, Ibu Siti Chadidjah Kaniawati gave a presentation about elephant conservation in Indonesia. The VESSWIC veterinarians gave presentations about general elephant health care issues, and IEF representative Charlie Gray gave a presentation about the basics of starting the training of elephant calves. The presentations with question-answer sessions lasted until lunch. In the afternoon a practical demonstration, led by Charlie Gray, concerning basic training of baby elephants was held. A four-month old male calf born at the camp and his mother were made available for the practical sessions. These sessions, led by Charlie, had been requested by the participating mahouts and were very well received. In between the practical sessions FOKMAS held round-table discussions with all the participants on a variety of topics about the position and professionalism of Indonesian mahouts. The Seblat CRU manager, Pak Aswin (BKSDA Bengkulu), was invited and supported to attend a field study tour of HEC and other elephant sites in Cambodia. This was an opportunity to share experiences with those working on similar regional projects. They explained about elephant conflict mitigation in Cambodia. Their mitigation activities are very similar to the Sumatran methods. One difference was using aromatic things that hang on trees. Another difference is that they never use trained elephants to herd wild elephants away from conflict situations. Overall the conflict in Cambodia is less than in Sumatra, and without any human deaths thus far. In Angkor Wat there are 18 elephants, 3 male and 15 females. Their ages are all above 40 years old, the oldest being 65 years old. The elephants were bathed twice a day at 8 am and 3 pm, and fed bananas and sugar cane. The elephants were given to the camp by government, private owners and zoos. The average cost for one elephant is $10.000. The manager is Gavin Bouchier and he takes care of the elephants with help of local mahouts and a veterinarian from Australia. The elephants are used for tourism, twice a day, (9 – 11 am and 4-6 pm), and paid $15 per 20 minutes. Kirirom NP is ±50.000 hectare, with 20 elephant permanently housed there and 5 elephant semi-permanently located there. Kirirom NP was once one area with Bokoh NP, but it has fragmented. 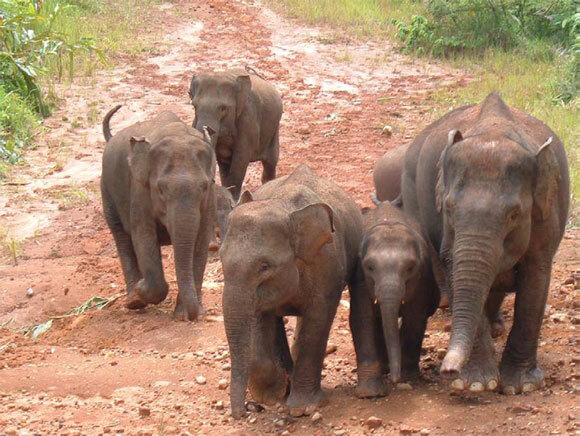 The elephant population in Bokoh NP is estimated to be 5 to 7. Bokoh NP is ±100.000 hectare. Ranger salary is $20 and FFI fund an additional $80. There are approximately 40 HEC conflicts per year and they mostly happen in October. They use noise cannon, electric fence, and observation towers to mitigate conflict. Location: FFI Conservation education program in school near Tropiang Nung River. Number of student at the school is 50, in first and second grade with one teacher. FFI built this school near a forested area that the community had illegally encroached. FFI built the school to provide conservation education and to increase the overall education level of each child in Tropian Nung River. Elephant population is estimated at ± 30 individual, in 183.000 hectare. The main problem is illegal logging. In 2002, 2 female elephant and 1 calf swam about 3 km to Nenas island, to run away from human activity. They have 45 rangers and 10 staff persons. There is a road that runs through a forest which has many elephants. On the side of the road, there is an information sign that shows that there are wild elephants in the area. There are many positive activities protecting elephants and forest areas in Cambodia that can be adopted in Seblat, Sumatra. Constructing a free school was especially interesting and the idea will be taken back to Seblat. Staff attended these 3 workshops in order to fulfill the invitation from Zoo Outreach Organization (ZOO), Coimbatore India and International Elephant Foundation. The workshop was relevant with our Conservation Education Program of Fauna & Flora International – Sumatran Elephant Conservation Program. The workshop’s focused on developing a Manual of Getting Along With Elephants: Human-Elephants Co-existence. This Manual is used as a tool of conveying conservation education messages to people living in such HEC countries like India, Nepal, Bangladesh, Indonesia, Thailand, etc, through various active teaching and learning methods. 1. To empower teachers of all kinds (school, NGOs, forest and wildlife personnel, etc) to teach about HEC and HECx. 2. To demonstrate innovative teaching and learning techniques designed to change human attitude and behavior for a better future. The objectives are delivered through various activities, that later will be transferred by the trainee as Educators and then share with students, colleagues, family, etc. The Manual demonstrates active teaching and learning techniques to make changes in human attitude. This will not provide a total solution, but serves as partial solution to live in harmony with elephants. 1. Venue: The place was not large enough for the approximately 45 participants, trainers and interns as it was too small to move about freely. 2. Participants / Trainee: The participants were very interested in the subject and participated fully and actively. 3. Trainers/ Intern/ Team work: All were good and worked as a team to share the skills of delivering the lessons and handling problems. 4. Material/ Lessons: All objectives were conveyed, although material was not finished, but it was well done. The agenda was very flexible changing as needed to the conditions of the workshop. Methods: active learning methods are very interesting and do not make people bored. We need to adjust some “serious” lessons so that the trainee does not become bored or sleepy. Perhaps making some adjustments in time and activity levels with energetic lessons inserted between more serious topics would be helpful. 5. Evaluation/Discussion: The evaluation conducted after workshop is the best way to find our weaknesses/ mistakes in the workshop. 1. Introduction: It was good that a Minister could attend the workshop and some activities could have been centered around him so that he would have to pay attention to the HEC and HECx issues. But on the other hand, a lot of time was consumed by his coming. Anticipation far before the workshop could be better to anticipate the program. 2. Participants: Although most of them could not write or read Bangla and English, they were very active and enthusiastic participants. Number was perfect – 35 people. 3. Venue: Venue was suitable and properly fit the requirement of the workshop. 4. Material: It is better to translate the manual into Bangla or the local language where the workshop is conducted. 1. Venue: The best and most suitable place for a workshop, good facility, food, weather, etc. 2. Participants: The proper number of participants – 33 people. 3. Materia: The same notes on Language and translation. 4. Special event: The cultural performance was very good. We could adopt that idea for our workshops. 1. Plan: all should be well planned before the workshop – lessons, materials, trainers, etc. 2. Language: Manual is better translated into local language ahead of time. 3. Time keeper: it would be better if someone could be a timekeeper. 4. Materials: do not give/teach so much material in a day. 5. Make sure the trainee understand the main focus of the training and the intention of the activities. 6. Develop samples of activities using their own methods/ways. 7. Encourage participants to continue the lessons to others/target of this education; students, colleagues, community, etc. 8. In our opinion, the best workshop was the second one conducted in Sherpur. We discussed the planning of the HECx workshops in Sumatra with BA Daniel, ZOO and Heidi Riddle, IEF. We discussed the logistical requirements, workshop arrangements, participant details, venue details, workshop locations, and local language details. We suggest having this HECx workshop in December 2009 or January 2010 or any time after March 2010. The Seblat CRU received a new male elephant “Harris”, recently moved to Seblat from the Kerinci Seblat National Park headquarters with support from IEF and the Saint Louis Zoo. This elephant is still a bit thin but is progressing well in his training and improved care, and has already participated patrols and other CRU activities. The Seblat camp manager, Pak Aswin, has been overseeing changes in the management of all the CRU elephants, since all elephants are brought in to the camp at night to prevent any further poaching as happened in 2007. Every evening the elephants are brought into the camp area, tethered to a post which has been cemented into the ground, and fed mainly palm fronds (received from surrounding plantations) and supplemental fodder from the camp garden which includes elephant grass, banana leaves and stems, sugar cane and pineapples when available. The elephants also receive a ration of cooked grain 1-2 times a week. 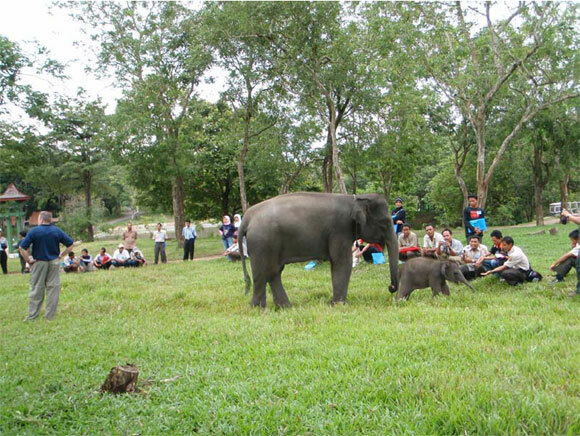 IEF has been supporting the Seblat ECC veterinarian Dr. Yanti Erni with a small monthly stipend to ensure ongoing health care for the Seblat camp elephants. Dr. Yanti has also been sent to other ECCs by BKSDA Bengkulu to learn more about medical management. Dr. Yanti provides regular reports and updates on inventory items to IEF. With BKSDA Bengkulu funding, the staff had recently built a small, new clinic building at the Seblat camp and equipment and supplies have been moved in. Additionally BKSDA Bengkulu is now allocating some annual budget for elephant medicines, but these medicines need to be ordered all at once. IEF may need to support emergency supplies of medicines if needed. The road through the Seblat forest used by a plantation to move the oil palm fruit out of the plantations has been a problem for the CRUs controlling illegal activity (logging, settling, and poaching). Currently BKSDA Bengkulu has an MOU with the plantation for the use of this road, but the MOU will expire in December 2009 and BKSDA Bengkulu is considering not renewing the MOU and closing the road. The Seblat CRU has also been monitoring a small wild elephant habitat patch in Air Teramang. This forest is seriously degraded but still supports a small population of elephants that may or may not travel between the Seblat forest and Air Teramang. BKSDA Bengkulu started the process in late 2005 to request the status conversion of land close to the ECC, namely a corridor to the nearby Kerinci Seblat National Park. The goal is to manage the land surrounding the ECC by increasing the status as a “Conservation Area”. This change of status needs to be issued by the Minister of Forestry. Currently the ECC land is “Protected Forest” (which can be easily changed to Production Forest or other functions by the local government). At the request of BKSDA Bengkulu, IEF has already written a letter to the Forestry Ministry supporting this change of land status. The government wants to eventually convert 48,000 hectares of forest in the surrounding area to logging concessions. One of the big oil palm estates on the western side of the Seblat forest (PT Agricinal) has been clearing land illegally within the Seblat forest to grow more oil palms. The CRU is challenging this but it has been difficult. And three coal mining concession within and close to the Seblat forest are still active – this means that while the last active exploration occurred several years ago, the permit is still valid so the company could come back in and drill some more. There is a growing concern in BKSDA that there are law enforcement costs related to CRU activity but not covered either under the CRU budget or by BKSDA Bengkulu. These costs are primarily for travel expenses for witnesses (i.e. CRU staff) and some small subsistence amounts for police officers that deal with the case, as well as some prosecuting attorney fees. The average total for each case is about $700-800 and the CRU estimates they have tried to prosecute about 3 cases/year since the CRU project started. There is a need to support this enforcement component so that conservation activities can progress. Acknowledgements: The International Elephant Foundation would like to thank the following for their financial support of this project.